Mega Sale! Free Shipping Included! 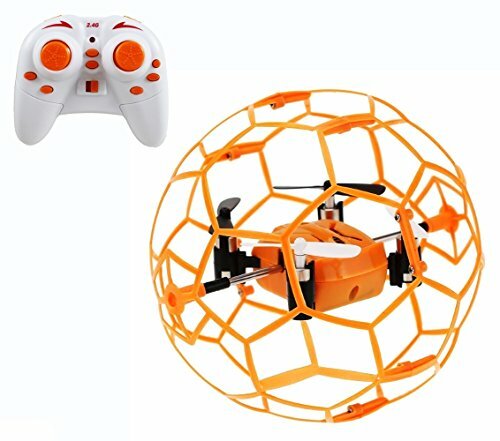 Save 22% on the Haktoys HAK901 Mini R/C Drone in a Ball Shape | Protective Frame Cage 2.4GHz 4 CH 3D Flip/Roll LED RC Quadcopter with 6 Axis Gyroscope and Slow-Fast Speed Modes | Great for Beginners, Kids and Adults by Haktoys at Open Drone. MPN: HAK901. Hurry! Limited time offer. Offer valid only while supplies last. The perfect drone experience: a fun mini toy drone that can be used in family gatherings and daily life, light weight and easy to use for beginners. The perfect drone experience: a fun mini toy drone that can be used in family gatherings and daily life, light weight and easy to use for beginners. Outer housing protects the inner body and blades. LED lights help with flying in the dark. Recyclable high-quality durable materials, ROHS, PB-free, CE, EN, ASTM, FCC compliant. Made in line with international health and safety standards. This is an RC hobby vehicle that requires training and experience before being proficient at flying. Allow a short break during play - It will maintain motor and battery life. Make sure to read in the product manual and follow safety precautions. Do not over-charge and over-discharge the battery. 4 x Spare Main Rotor Blade (Black-A, Black-B, White-A, White-B) Make sure to replace the correct rotor blade. HAK Toys stands by every product it offers, and it would never offer a product that does not pass HAK Toys' strict quality measurements. If the product does not meet your expectations, we will make it right - guaranteed! Features surrounding protective frame for added safety and longer life. Slow-fast interchangeable speed modes, 360° flip-n-rolls, indoor and outdoor flight, ready-to-fly out of the box. 2.4GHz wide-range frequency controller with up to 120 feet control distance, full proportionality and anti-interference which allows multiple R/C hobby products to be raced at the same time. Quadcopter measures 4" diagonally. High-quality materials made in line with international health & safety standards. Great for beginners, excellent gift for ages 8+. Does NOT come with camera. BATTERY INSTALLATION: Please refer to the last product image for visual instructions. 1- Take out the black foam rubber. 2- Insert the battery inside the battery compartment. 3- Plug the cord in. If you have any questions about this product by Haktoys, contact us by completing and submitting the form below. If you are looking for a specif part number, please include it with your message.